The LVDT Simulator is used to test LVDT or RVDT sensors. Using a 0-10VDC command signal input and an excitation (drive input), the unit provides two simulation outputs of 1-5VAC. An internal 3kHz oscillator can be utilized as an alternative excitation source. Both outputs are fully isolated. 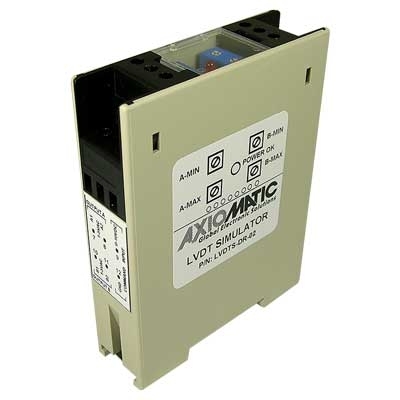 The unit accepts power supply input from 4 to 32VDC. When the input voltage increases from 0-10VDC, the output voltage A increases from 1 to 5VAC and the output voltage B decreases from 5 to 1VAC. Factory settings for the offset (minimum) and span (maximum) are user adjustable. A LED indicates power is OK. The unit is conformal coated and available in a DIN rail mount housing.